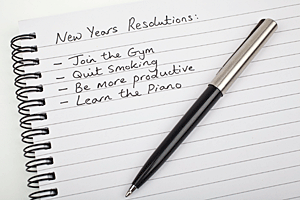 Here are seven ways to make your New Years resolutions succeed. It’s New Year’s resolution time. Every year, we sit down with a renewed determination to finally lose the weight, pay off the credit cards or launch that business venture. And every year, 92 percent of us fail. You might say New Year’s resolutions are fairy tales grown-ups tell themselves. But why don’t we succeed? A year is just too long a time to accomplish one’s goals. In January, it’s easy to procrastinate when you have another 11 months in which to get to work. Even in mid-July, there’s still plenty of time to make it happen; there’s no real urgency. The next thing you know, the holidays are looming, and it’s too late. There’s nothing left to do but pin one’s hopes on the coming year. “For many people, this depressing chain of events recycles on a yearly basis because far-away deadlines allow — even encourage — us to be slack on execution,” says Moran. Here’s where the “12 week year” comes in, a system based on a shorter time horizon that can deliver results. With this approach, you no longer have the luxury of seemingly endless time stretching out before you. Each 12-week period stands on its own. As a result, each week, each day, each second counts and the day of reckoning looms. Realize that success happens now. According to Moran, most people see success as something that happens in the future. “Success is all of the little things you do throughout the year to make your goals happen.” Fulfillment of a goal is found in the fulfillment of each step along the way to that goal. Throw away your yearly planner. If you map out your entire year on January 1, and unexpected delays crop up early on, you may be tempted to throw in the towel entirely. Planning this far out requires many assumptions that may not prove valid. “Once you realize that there’s just not enough predictability to make annualized planning effective, the 12 week year begins to make a lot more sense,” explains Moran. Be honest with yourself. Do you have a habit of ditching commitments? It’s all too easy to make grandiose promises at the beginning of the year. Given a long time horizon, our interest and commitment have time to wane, and we soon forget about our goals. Celebrate your 12-week wins. Many businesses throw yearend parties to acknowledge their successes. Apply this concept to the “12 week year,” and reward yourself when you accomplish your goals. “Especially for goal-driven people, it’s tempting to always look at what lies ahead and not fully appreciate the ground that has already been covered,” observes Moran. “It’s not uncommon for individuals and even entire organizations to have mentally given up on their goals before October. With the 12 week year, that will never happen again.” With a shorter time horizon, you have repeated chances throughout the year to finally make those resolutions a reality.